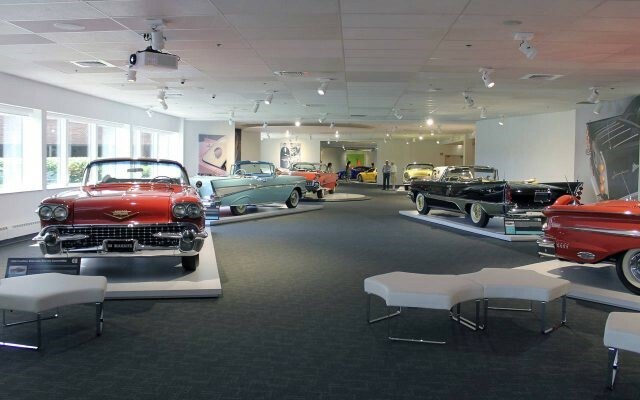 Newport, R.I. — Car enthusiasts now have their pick of destinations to get their fix while visiting Newport, with two car museums featuring classic and rare cars, the newest having opened just last month. The Audrain Automobile Museum and the Newport Car Museum both place a strong emphasis on design and display the cars as works of art. The museums fit right in to the spirit of Newport, a resort destination known for its mansions, folk and jazz festivals and beaches. Wealthy families have summered here for generations — bringing with them their cars. “There is a car culture here, and it goes right back to the late 19th century when Willie K. Vanderbilt was acquiring and racing cars. Some of the very first car races in the United States happened right here in Newport,” de Muzio said. Cars became part of high society, as vacationers spending time at summer homes would parade their cars around town. Some of those car races were held on the beach here, or on Bellevue Avenue, the leafy boulevard lined by Gilded Age mansions, de Muzio said. Both museums are drawn from private collections, and they are different and complementary. The Audrain, which opened in 2014, is located in a historic building on Bellevue, next to the International Tennis Hall of Fame. It rotates through four exhibits per year of around 20 cars, drawn from a collection of 225. It has what de Muzio calls an “encyclopedic” focus, with a wide range of different makers and years, from prewar cars to the present day. An exhibit that was on view through June 25, “Drop Dead Drop Tops,” focused on convertibles and featured a range of cars, from a 1930 Pierce-Arrow Model A to a one-of-a-kind white and blue 2013 Bugatti Veyron 16.4L Grand Sport Vitesse “Le Ciel Californien.” The exhibit even included curiosities such as a 1957 Ferrari Bimbo racer, a 12-volt electric children’s car that was based on the open Ferrari Spider of the time. The Audrain’s new exhibit, “Fast, Fun & Fabulous: Best of Show,” featuring award-winning automobiles that are a superlative example of design or that have won races, opened last week. There’s still a new car smell at the Newport Car Museum, which opened June 1 and is actually in neighboring Portsmouth, a short drive from the attractions of Newport. The museum is housed in a 55,000-square-foot space in a building once used by defense contractor Raytheon to manufacture missiles. The displays here are drawn entirely from the private collection of Gunther and Maggie Buerman. 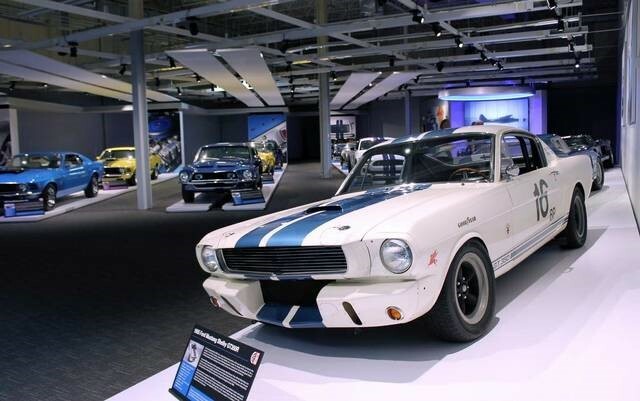 Around 50 cars are displayed in five galleries, with classics including Ford Shelby racing cars, Corvettes, Mopars and a large collection of fin cars, as well as some European, British and Japanese cars. Every model of Corvette, from a C1 to C7, is here. There’s a 1965 Ford Shelby 427 SC Cobra, designed by American automotive designer and racecar driver Carroll Shelby, one of just 31 made, and valued by Gunther Buerman at $3 million. From a 1954 Buick to a 2017 Dodge Viper ACR, Gunther Buerman said he wanted the museum to appeal to all ages. “The idea is to span that whole generation, so that the grandfather can come, the father and son have something to enjoy, the mother, the grandmother. The whole family can come and see something of interest,” he said. 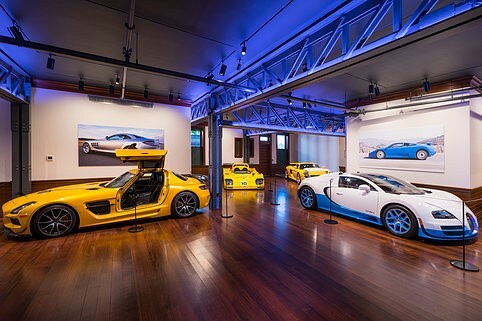 AUDRAIN AUTOMOBILE MUSEUM: 222 Bellevue Ave., Newport, Rhode Island, next to the International Tennis Hall of Fame, http://audrainautomuseum.org. $14; seniors, military, students, $10; children 6 to 17, $8. Open 10 a.m.-4 p.m. daily. NEWPORT CAR MUSEUM: 1847 West Main Road, Portsmouth, Rhode Island (near Newport on the campus of defense contractor Raytheon), https://newportcarmuseum.org. $18; seniors, military, students, AAA members, $15; children 5 to 15, $5. Open 10 a.m.-4 p.m. daily.